Cash Back Assistant is an annoying adware application that manifests itself as a huge sidebar on the side of your Internet browser. You should remove this application because it is not going to assist you with anything; on the contrary, it will take over a chunk of your Internet browser window to promote advertising material. The sidebar might open random websites and promote third-party material, which we are confident you will not find worth your attention. Even if you get tempted to click on one of the the featured links, you should know that adware applications like Cash Back Assistant rarely take responsibility for the content they serve to their users. That is, the links this adware application throws out to your Internet browser are not always safe, because sometimes they might lead you to unsafe pages that contain malware. Read this article to learn more about Cash Back Assistant and why you should remove it to prevent your computer system from getting infected with threats. Cash Back Assistant is an advertisement-supported program, which means that it is interested in providing you with the most alluring advertising material possible. The goal: to make you click the links, and thus, in this way, generate web traffic for third-parties. You should not trust this adware application but instead delete it from your computer, because it collects information related to your Internet surfing preferences, and users are seldom explicitly informed about the nature and purpose of this data collection. Cash Back Assistant does not deserve to be on your system and should be deleted also due to the methods it employs to get onto your system. It is unlikely you would install this application separately; still, Cash Back Assistant might reach you within a software package (a bundle), along with additional software. This approach is mostly utilized by software of questionable nature and origin that throngs all the pirate sites and other unreliable software distribution sources. Remove Cash Back Assistant and the affiliated applications because they both might be malicious and work to undermine your computer security. If you have come to the conclusion that Cash Back Assistant is not necessary, and even dangerous, you should remove it from your system. You can accomplish this task via Control Panel; the whole process is described in the clearest manner possible in the step-by-step instructions we have provided below this text. However, remember that the automatic removal method, employing automatic antimalware, is what we strongly suggest. It will ensure that even the stealthiest malware is found and terminated from your computer; also, it will guarantee protection from the future attacks. Move the mouse to the bottom right corner of the screen to open the Charm bar. Choose Cash Back Assistant in the program list. Select Cash Back Assistant in the program list. 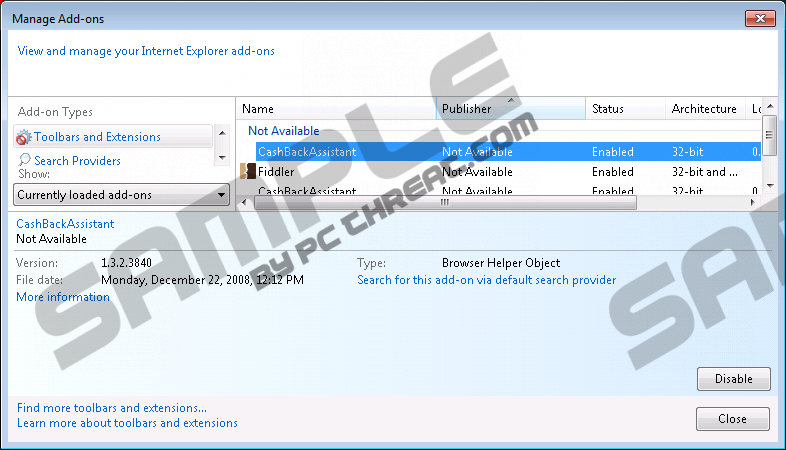 To remove Cash Back Assistant, click Uninstall/Change. Quick & tested solution for Cash Back Assistant removal.